A dead give-away that you need to adjust the carburetor on your Lawn-Boy mower is excessive gas consumption or black smoke when the mower is in operation. 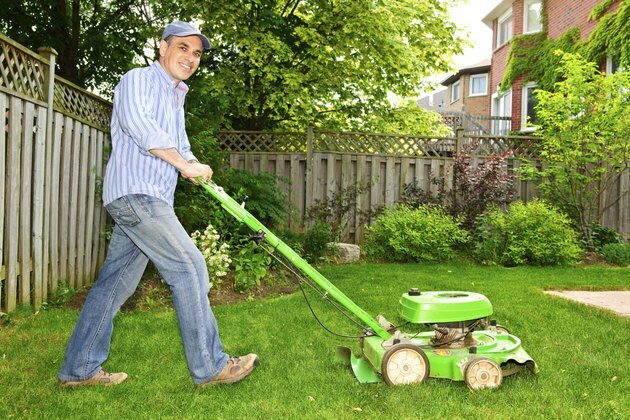 If your Lawn-Boy has been in storage for a while or was recently serviced, it may need a carburetor adjustment. The process is the same for any model of Lawn-Boy. You just need to know where to locate the adjustment screws and how to adjust them to keep your Lawn-Boy mower running smoothly. Proper carburetor adjustments help mowers perform. Locate the carburetor on your Lawn-Boy mower. Start at your gas tank, find the fuel line and follow it to the carburetor. If your model is equipped with a fuel pump, continue following the line from the fuel pump to the carburetor. The fuel pump looks like a tube, but the carburetor looks like a tube with a flat box on top with a circular attachment on the side. Identify the three adjustment screws. If you can see two screws next to each other on the outside of the carburetor, the screw closer to the engine block is the idle air mixture screw. The one farthest from the block is the main air mixture screw. If you only see one screw on the side, that is the idle screw. The main air screw will then be located toward the bottom of the carburetor. The third adjustment screw will be located either to the front or rear of your carburetor, depending on your model. This is the screw used to set your engine idle. Use a flat head screwdriver to slowly turn the idle air screw and the main air screw clockwise until they are "seated" in the carburetor. To "seat" a screw means to screw it in as far as it will go without tightening it into place. You want the head flush to the carburetor. Then turn both screws counter-clockwise one and one-half turns. Hold the throttle open on your Lawn-Boy mower. Use the throttle on the handle, or remove the air filter and hold the plate in the center open so it is straight up and down. Start the engine and turn the main air screw in small increments, either in or out, until the engine runs smoothly and is not racing or stalling. The direction needed will depend on your altitude and climate. Release the throttle. Turn the engine idle screw slowly clockwise until the engine begins to sound as if it is going to stall. As soon as you hear this, turn the screw counter-clockwise (very slightly) until the mower runs smoothly. Give the engine gas, and adjust the engine idle screw again so it runs smoothly when receiving gas.